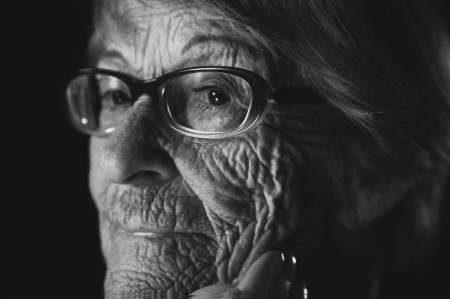 This handsomely stripped-down long interview in black and white shows only the torso and very wrinkled face of Brunhilde Pomsel, 103, born in 1911, who was the stenographer of Nazi Propaganda Minister Joseph Goebbels in the years of his glory and defeat. You've had the banality of evil. Here you get the glamor of wrinkles: the contrasty black and white images (from the cameras of Frank van Vught and Davor Marinkovic) look inexplicably great as the tough old bird grinds out her slow monologue for an hour and 48 minutes. The sharp lens, dramatic light show the gleam in her glasses, the glisten of her spittle. The microscopic portrait is frequently interrupted with brief moments of pungent archival footage, providing footnotes and commentary. As Haaretz's Ofer Aderet comments, the only new light on the Nazi regime is Goebbels' love of his oversensitive Airedale Terrier, which was flown to keep him company on a trip to Venice, a venture that didn't go well. (The dog had to be sent back.) But there is much more here than that: a rare insight into a mentality and a time of which living memory is now very rare. Pomsel's description of her childhood, when she remembers her father being called to serve in WWI and returning from it, shows discipline and narrowness. Back from the war, he made the many siblings give up their chamberpots and use a collective outhouse, and punished them severely with a strap. As a young women she was parrochial and naive, unable to distinguish an Indian from a Japanese person and finding them very exotic. She says there is a Devil but no God; without religion, she worked for two Jews in early jobs, and a good friend was a Jewish contemporary, Elsa Lieberman, who waited for her while she signed up as a member of the Nazi party so she might get a job on the radio. It cost her 10 Marks, so she and the impoverished Elsa couldn't go for coffee afterward. Her boyfriend named Heinz - or is he just a friend? she never married - took her to a big rally at the Berlin Sportpalast where she cheered, of course "our dear Führer;" "he was the new man." She didn't describe this outing to her dear Jewish employer, Dr. Hugo Goldberg, whose career as a lawyer was dwindling so he could only pay her half time. Dr. Goldberg emigrated as of 1933, and Pomsel got a job typing the memoirs of a rightwing nationalist frontline veteran. It was a friend of hers who was in the Nazi party who got her a job with Berlin Radio; that was what required joining. From there she was transferred to the Ministry of Propaganda, and from 1943-45, to the prestigious, high-paying job of stenographer, secretary, and typist for Goebbels himself. Clearly this was an eager and ambitious young woman who did not think and did not question, or chose not to, and who grew up in a world with many like her. Equally clearly she was a shameless opportunist who went where the money was and liked the clothes, furniture, and classy people in Goebbels' offices. She describes Goebbels as elegant, a real gent, but admits he was on the short side; he walked with a limp, but carried it off with confidence and swagger, though how he turned into a "raging midget" for rallies is a mystery to her. She claims they all knew of concentration camps but not that the Jews were being "burned." It all sounds familiar, but there is still the cold, clammy fascination. In their statement the directors ask if the conditions that led to Naziism, or ones like them, are not returning today, only this time to all over Europe instead of just Germany. "We want to show with this film that war and tyranny does not come out of nowhere, that a social climate can tilt very quickly, that the supposedly evil is not always recognized and that you have to question your own moral positions repeatedly." The filmmakers came upon Brunhilde Pomsel while researching other material and decided she rated a film of her own. (As perhaps the last surviving person who worked close to the top Nazis, she surely did.) 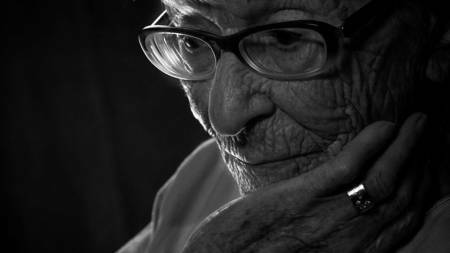 Born in 1911, she wound up as Goebbels' stenographer hidden in a secret bunker when the war ended. With Denazification she was held prisoner by the Russians for five years. She says that was unfair. I'd say she got off easy, especially since after her release in 1950 she was able to go back to working in German broadcasting until her retirement in 1971. If you want to ring her up she lives in Munich now, at 105. A German Life/Ein deutsches Leben, 108 mins., in German, debuted at Nyon, Switzerland (Visions du Réel) in Apr. 2016; also Munich, Jerusalem, and the San Francisco Jewish Film Festival, and it was as part of the latter that it was screened for this review (showing July 24 & 25 and Aug. 7, 2016) . Produced by Blackbox Film & Medienproduktion GmbH (Austria); distributed by Cinephil (Tel Aviv).